(Newser) – Michelle Obama's speech to the Democratic National Convention is being widely hailed as a triumph. Even many conservative pundits praised her performance, while some of the giddier Democrats are now hoping she plans her own run for office. She "knocked it out of the park" by delivering "a series of devastating contrasts with the Romney family and policy agenda, cloaked in the bromides of wifely love," writes Garance Franke-Rute at the Atlantic. Michelle "reminded that she hasn't just been growing vegetables in the White House garden—she's been sharpening her political skills, too." Michelle "turned in a masterful showing, delivering a subtly yet distinctly political speech without seeming to do so," writes Guy Benson at Townhall.com. "It remains to be seen whether her uber-personal reintroduction of 'Barack' will sway too many viewers, but I think she did everything she could on her husband's behalf." "In a cloyingly theatrical modern tradition, first ladies attend the national conventions to testify about biography, not policy," writes Irin Carmon at Salon. But Michelle "managed to effortlessly marshal both to tell a story about change in America—with the promise of more to come—and to deliver her speech transcendently." Michelle "largely avoided the treacly pitfalls of the spouse’s speech, in favor of crystal clear, passionate advocacy for her husband’s work, and the values that guide it," writes Tommy Christopher at Mediaite. His favorite line was: "Success isn’t about how much money you make, it’s about the difference you make in people’s lives," though "it’s a tossup as to whether the sentiment, lovely on the lips, gets any traction on the ground." What a crock! Prep schools, ivy league, all paid for w/ affirmative action funds. She would understand the average american much better if she actually worked AT ALL to put herself through school like I did. She must have forgotten all of her fribees jetting around the world on luxurious vacations on the citizen's tax dollars. 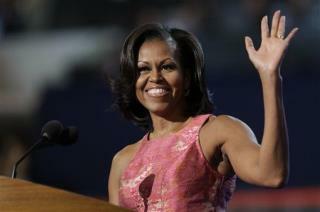 Michelle Obama, as always, is a class act. Born on Chicago's rough south side, she is an American success story. Not everyone can be born on Third Base, like the Romneys.